"I wanna sail the Chester River ...Lordy, that's what I call fun." Launch: Long Cove Launch Ramp, off Langford Creek. Small fee for launching. We left the truck and trailer at a local friend's field. Or launch at Chestertown Marina ramp, and leave your truck and trailer there. Comments:-- Chesapeake Bay is a drowned river. More than two hundred miles of prime lowland woods and fields, that once bordered the Susquehanna River, are submerged beneath an inland arm of the ocean. About a quarter of the way down from the top of this estuary, a river enters from the Eastern Shore. It is a meandering, aimless river sauntering calmly through some of the most serene countryside bordering any Chesapeake water. This is the Chester River. --- -Humans have lived along the banks of the Chester River for tens of thousands of years. When Captain John Smith, the first European to explore the Upper Chesapeake, 'discovered' the Chester River in 1608 he found the area occupied by the Wicomiss Indians. 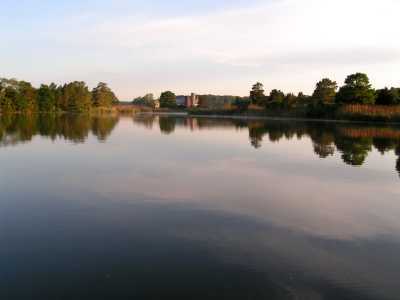 As English settlers settled the banks of the river, they named Kent County for their home shire in England. When Maryland's first legislature met in 1649, Kent was one of two counties in the colony. 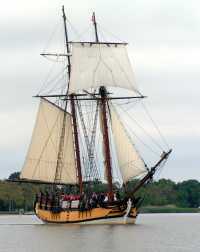 --- -It is difficult, in 21st Century America, to appreciate the importance of the Eastern Shore in Colonial times. Today, our country spans a continent - then the colonies spanned from the beaches of the Atlantic to the eastern flank of the Appalachian Mountains. To better appreciate the role of Chestertown, one can follow the center of national population. --- -The first national census was taken in 1790, not long after the first Tea Party and the founding of our nation. At that time, the "center of population," the statistical geographic center of the location of all the surveyed residents of the new United States, was eight miles northwest of Chestertown, MD. 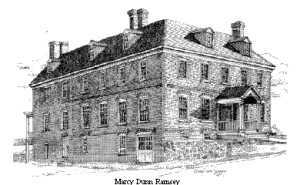 --- -The main route from the southern colonies to the north was by ferry across the Chesapeake from Annapolis to Rock Hall, through Chestertown, and north up the Delmarva Peninsula to Philadelphia and beyond. George Washington, and virtually all the southern delegates to the Constitutional Convention, followed this road to the north. 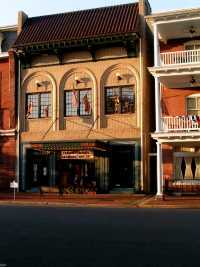 Chestertown was the 'center' of activity. --- -The 'center of population' crossed the Chesapeake just before 1800, reflecting the Westward Movement. In 1820, it crossed the Potomac. Just after 1850, it was west of the Ohio River, roughly tracking the 39th degree of latitude (paralleling US Route 50). In 1940, the 'center' moved southwesterly across the 38th degree reflecting population increase in America's Southwest and in the 1970's it crossed the Mississippi River. Today, the center is in east-central Missouri, creeping southwesterly about ¾ degree each decade, and over 1,000 miles west of Chestertown. Today, the Eastern Shore is far from the center, and has faded into rural tranquility. 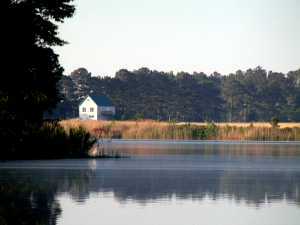 --- -Thirty miles up the Chester River from the Bay, colonists established the village of Chestertown. Beginning with a Governor's proclamation in 1668, there had been intermittent proposals to establish a colonial port at about this spot on the river. 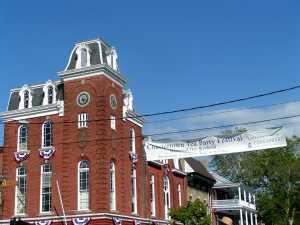 The building of the county court house in 1697 established a center for the town. 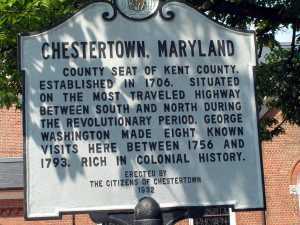 By the early 18th Century, Chestertown had become a prosperous mid-Atlantic Royal Port of Entry for the colonial movement into Maryland. 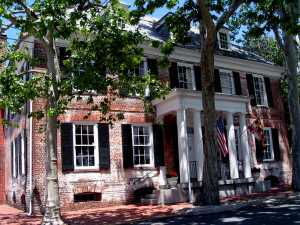 Along with being a prosperous ship building and trading center, Chestertown became a locus for education, government and court. 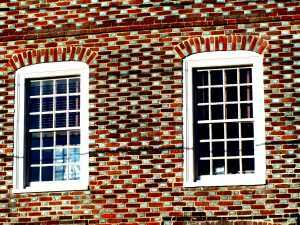 In 1706, the town became the county seat, but the county's court records are the oldest in Maryland, dating back to the 1640's. --- -In 1782, Washington College, tenth oldest liberal arts college in the US, was founded. George Washington, lent his name and money (his was the single largest money gift to the new college). This was, in part, due to his appreciation for the county's supplying flour and men to his Continental Army. Early agriculture on the Eastern Shore was founded on tobacco, but, just before the Revolution, most farms made a shift to wheat production, increasing both the population and prosperity of the community. Large wharves once served sail and steam boats in their local and transoceanic trade of goods, and a large Customs House was erected on the waterfront. 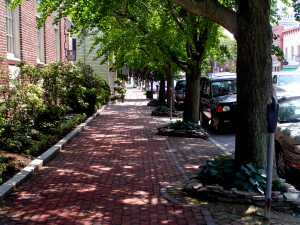 --- - A stroll along Chestertown's brick sidewalks, under the shade of ancient basswood trees, soon reveals architectural delights. What began as a search for an ice cream shop turned into a promenade through the history of American architecture. --- - We have long been interested in the origin of American architecture, but lacked the discipline to just sit down and learn its evolution. Architecture is, like many professions, obfuscated by words. We decided to cut through that verbiage and let the buildings 'talk' to us. We had a handy guide describing dates and styles, so early one morning we wandered the streets of Chestertown and back into the history of America. - - Later, licking that ice cream, we pondered the amazing lifestyle offered by our cruising lifestyle. Life on the water forces a slow pace -- the opposite of what our culture forces on most folks. When we come ashore, we often have the time to observe and learn -- in this case, about American cultural history. --- - During our years as a British colony, throughout the 1700's, we were under the rule of kings named George. Folks then (like always, I suppose), tried to impose and maintain order in their lives. A home, back in Colonial days, was designed to display this order. Buildings had simple geometric proportions. A symmetrical plan was arranged neatly about a central axis. There are usually five windows facing the street on the second floor. The main entrance had matching columns and a simple roof to shield guests from the weather. The building, hopefully, was a declaration of the simplicity and order within. --- - During Georgian times, brick became a fashionable construction material for the homes of the wealthy. Bricks are made from firing clay, and they acquire their appearance from their native material. Almost surprisingly, most bricks are red or yellow in color. There is a good geological reason: iron is the most common 'coloring' material for sediments derived from rock. And during the firing of the clay, that iron is exposed to air, and rusts to a brown, yellow or red color. --- - Bricks can be placed in different ways. In the most common brickwork, only the sides (stretchers) show to the street. This builds a wall with the least number of bricks and is the least expensive. This design is termed stretcher, or American, bond. If bricks are placed so only their ends (headers) show to the street, a bricklayer can create patterns. 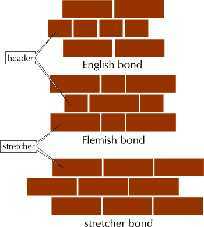 The style known as Flemish bond alternates stretchers and headers, for a pleasing and orderly effect. 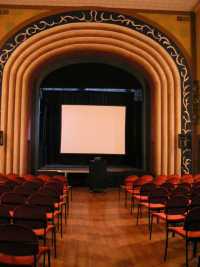 In English bond, a row of stretchers has a row of headers laid atop, varying the visual effect. --- - Bricklayers found other techniques, other than the bond, to vary their work. They mixed the colors or glazing of bricks for aesthetic effects. 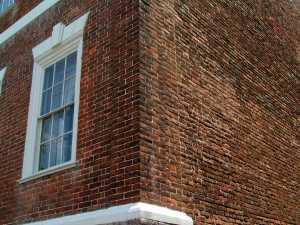 --- - Plain brickwork was, for some colonial Maryland folks, too simple. Folks in Annapolis and Chestertown experimented with bonds and colors. --- -The Custom House, built in 1746, stands near the public dock. It is an excellent example of Georgian architecture and Flemish bond brickwork, with the 'heads' showing to the street, glazed for stylistic beauty. --- - Continue walking around town, and you will see many homes of Georgian style. Each is different, reflecting the taste of the orignial owners or the result of modifications by later residents. 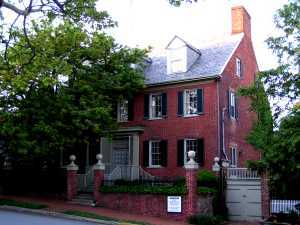 --- - One of the oldest houses in town is the Hynson-Ringgold House, home for the president of Washington College. This home, built in 1743, has anchored this street corner for more than two and a half centuries. It also has Flemish bond brick walls. - -The Georgian Wickes House, built in 1767, has five bays, a gabled roof and dormers, and 15 fireplaces. It is also of Flemish brick construction. --- -Perhaps the finest of the Georgian houses is Wide Hall, built in 1770. This home was built by a merchant, the County's wealthiest citizen of that era, Thomas Smythe. He was an illustrious Revolutionary War activist. Reflecting the wealth of the owner, it has all-header-bond brickwork. It is a classic. 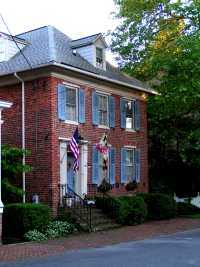 -- -This style remained popular in Chestertown until the 1830's and had later periods of revival. --- -We were a proud, new nation after the Revolution. Architecturally, America celebrated with a new design, the Federal Style. Our link to a British past was retained by the orderly arrangement of windows and doors, neatly symetrical around a central axis. However, life in America was more simple, freed from monarchy and aristocracy. Our new style showed a smooth facade to the street, and the roof had a low pitch. The entrance was simple, with delicate columns and molding. The discovery of Pompe generated interest in Greek and Roman architecture, so some homes incorporated themes from classical times. Windows were tall and had large panes. The interior of the house most clearly seemed to express the freedom recently achieved by war. Rooms, were circular, oval or octagonal, with garlands, swags, urns, and rosettes as walls decorations. Colors were often pastel and airy. 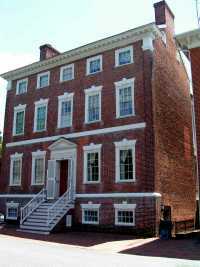 --- - River House was built in the 1780's, and is an excellent example of a Federal Style home. It was also first owned by Thomas Smythe. It has Flemish bond brickwork (alternating stretchers and headers) on the street side and American bond (courses of stretchers, broken with courses of headers) on the other sides. A high three-story façade rises above a tall English basement. 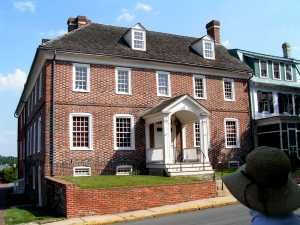 This house is typical of Philadelphia town houses, in Federal Style, that were one room deep with no windows on the sides. - -In the center of town, just off the square, is a rarity - the White Swan Tavern, built in 1733. 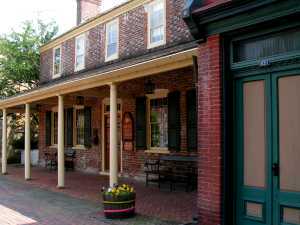 It is one of the few Colonial taverns in existence, and served George Washington on one of his many visits to Chestertown. The building was built as a residence, with Flemish bond brickwork with glazed headers. It was enlarged into a tavern in the 1790's and remained active until the 1850's when it became a general store. In the 1970's, an archaeological excavation yielded 70,000 objects from the site prior to restoration to its 1795 appearance. 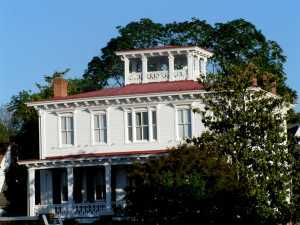 --- -This waterfront home, built in 1857, is an excellent example of Italianate Style. The roof has a low pitch, and there are ornamental brackets under the eaves. The balustrades on the porch are pure fancy jigsaw cuts. A pleasing symmetry and an open airy feeling are hallmarks of this design. --- -This was a popular late 19th century style, inspired by French designs built during the reign of Napoleon III. The style, also called Tuscan, evoked European majesty by aspiring to a monumental and ornate appearance. It was widely used in public buildings and houses in the 1870's and 80's. --- -In Chestertown, Stam's Hall, built in 1886, is an outstanding example of Second Empire Style, also known as Beaux Arts. The townsfolk were proud of their building, and contributed $1,000 to pay for a bell in the tower, which still tolls the hours. 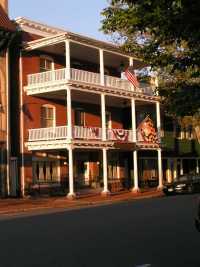 --- -There are many other interesting buildings in town, including the structure that houses the Historical Society, the Court House, and a number of small office buildings known as Lawyers Row. --- - Boston was the main entry port for British goods in the Massachusetts Colony. Local residents of Boston were infuriated by the imposition of punitive taxes imposed by the British Crown in 1773. 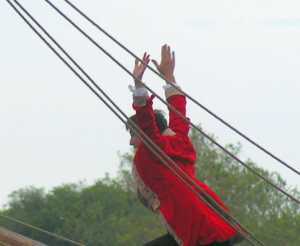 In response to the Tea Tax, citizens, dressed as Indians, boarded a British trading vessel. They threw its shipment of tea into the harbor. - - Chestertown, at that time, was a main British entry port into the Maryland Colony. Its town citizens met in anger in the spring of 1774, in response to the closing of the Port of Boston by the British. They forth "Resolves" forbidding importing, selling, or consuming tea in Chestertown. 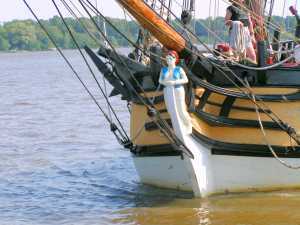 In the spirit of the Resolves, on May 23, 1774, local residents gathered at the town center, marched down High Street to the British brigantine Geddes, anchored in the Chester River, and angrily consigned her cargo of tea to the depths of the Chester River. --- -Chestertown has held its first Festival commemorating this event in May of 1968. 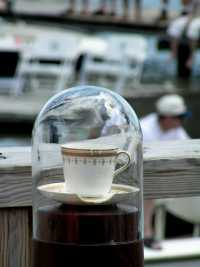 A reenactment of the Tea Party was held at the waterfront. 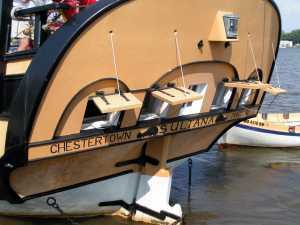 In 1992, we sailed up the Chester River to Chestertown. By lucky accident, it was Memorial Day weekend, and we landed in the middle of the Tea Party Festival. We tied off and had such a good time that this year (2005) we decided to return on Halcyon. 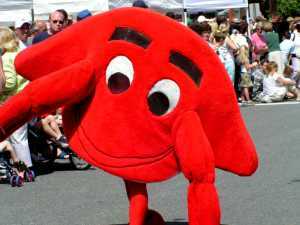 --- -The town exploded for the weekend - with streets cordoned off, a Colonial Parade marched through the center of town. 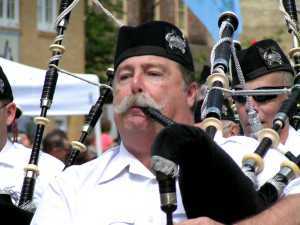 The parade featured the Kiltie Band of York, the 1st Battalion of MD Loyalists, the Newark Fife and Drum Corps, horse-drawn carriages, and the First Maryland Regiment. 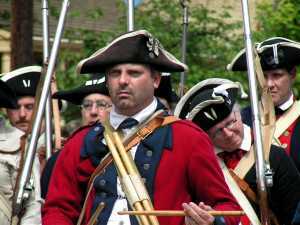 There was colonial dancing, Native American dances, pipe bands, fife and drum performances, military drills, and colonial song fests. Over 120 craft experts - from blacksmiths and candlemakers to weavers and woodworkers presented their skills and wares. --- - At the waterfront, lay the ship Sultana. She is a meticulously-crafted reproduction of a 1768 schooner that plied the waters of Colonial North America in the service of the Royal Navy. Built directly from original plans, Sultana was launched in 2002 and is considered to be one of the most accurate vessel reproductions in the world today. She provides nonprofit, unique, hands-on educational experiences in colonial history and environmental science. 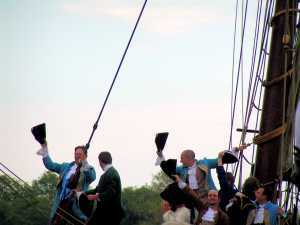 --- -The Sultana served as the surrogate for the British trading vessel ,Geddes, during the reenactment. As we watched from the dock, an angry crowd, somewhat lathered by spirits, gathered at the town square and marched to the waterfront. 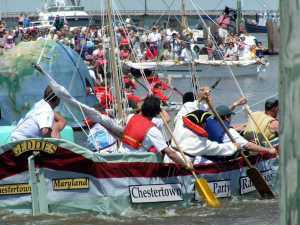 Rowing vintage boats to the 'Geddes,' the 'colonials' tossed bales of tea (and British officers) into the Chester River. The crowd roared approval, and black powder guns puffed clouds of smoke over the river. It was a great excuse for a party. --- -On Sunday, the highlight of the afternoon was the annual raft race on the Chester River. 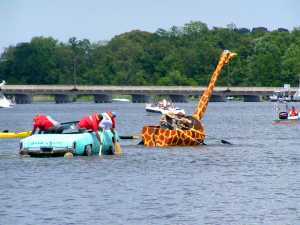 None of the rafts are allowed to use a boat hull for their construction, so imagination is paramount. There are prizes for the greatest disaster and most original as well as the race winner. The crowd roared approval at every disaster, and a good time was had by all.